Product Description Designed to be used with all Dremel accessories and most threaded attachments, the Dremel 8000-03 Lithium Ion Cordless Rotary Tool is ideal for home improvement enthusiasts, hobbyists, and do-it-yourselfers. Powered by a long-lasting lithium-ion battery, this cordless wonder provides the reliability and control needed to tackle any project, anywhere. 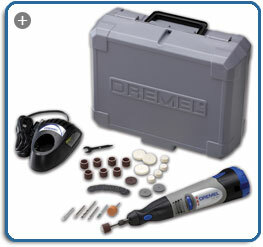 The 8000-03 also offers the longest run-time of any Dremel cordless model and comes with 40 genuine Dremel accessories, including felt polishing wheels, grinding stones, cut-off wheels, mandrels, and more. With 40 accessories, the 8000-03 handles a range of household, vehicle, and crafting jobs.View larger. This rotary tool's lightweight, cordless body makes for easy maneuvering. Variable speeds ensure precision with both delicate and tough materials.View larger. More convenient and less expensive than relying on a range of different tools and accessories to meet your needs, the 8000-03 is a single, compact unit that grinds, cuts, sharpens, polishes, and cleans. Whether your passion is home improvement or elaborate craft and restoration projects, this easy-to-use rotary tool is a must-have. Thanks to its cordless design, the 8000-03 is ultra portable. It goes where you go, and it offers the flexibility to handle whatever project you dream up. Measuring 9.25 inches long and weighing just 14 ounces, it's lightweight and easy to maneuver. In short, it offers all the convenience of a corded model without the hassle of a cord. To help ensure reliable, long-term performance, the 8000-03 utilizes lithium-ion battery technology. The high capacity 10.8-volt battery provides an extended run-time--holding its charge up to six times longer than nickel-cadmium batteries--up to two years in storage, so it's always ready when you need it. For added convenience, the battery power gauge on the tool lets you know when it's time to recharge, and you can store the battery on its included charger without shortening its charge capacity. The 8000-03 is a variable-speed tool, which means you can select the right speed from 5,000 to 35,000 RPMs to match both the job and the accessory. Incredibly versatile, the 8000-03 has the strength to handle a range of household, vehicle, and crafting jobs. And thanks to the 40 included accessories, your imagination is the only limit to what this compact powerhouse can accomplish. Sharpen a chain saw blade, cut through fiberglass, restore model railroad cars, handcraft a bead bracelet and necklace set, complete a complicated robotics project, repair baseboards and window trim, clean a boat engine, and even groom your dog's nails. The 8000-03 can truly do it all. 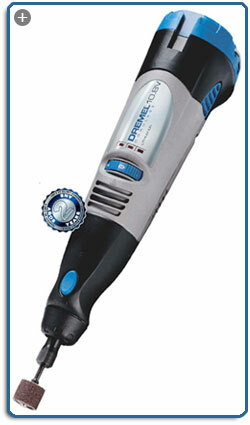 Founded in 1932 in Racine, Wisconsin, Dremel is the industry leader in rotary tools. The company owes its success to the inventive genius of its founder and namesake, Albert J. Dremel. In his lifetime, Mr. Dremel owned 55 patents on a wide range of products from electric erasers to a gas-powered rotary lawn mower. His most famous and important invention was a high-speed rotary tool, dubbed the Dremel Moto-Tool. Compact, lightweight, and perfect for a wide range of jobs, the rotary tool was an immediate hit with hobbyists and eventually became accepted as one of the greatest inventions of the 20th century. 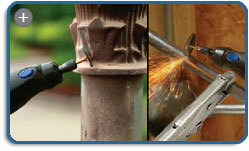 Today, the Dremel name remains synonymous with utility, durability, and innovation.